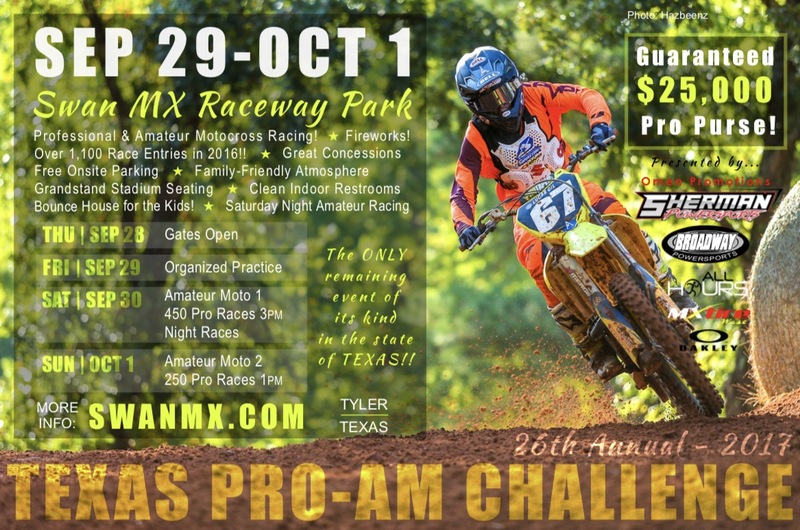 Calling all pro and amateur racers!! Start making plans!!! After last year’s record-breaking turnout (1,100+ race entries! ), we will be opening the gates on THURSDAY (Sept. 28) to better accommodate everyone! Invite all of your favorite pro riders to come and race for their chance to win some of the $25,000 guaranteed pro purse! In the 26 years of having this event, we have already given away over $625,000!!! We look forward to seeing who will come for this year’s challenge! We will have day racing, night racing, fireworks, bounce houses for the kids, and more… This will definitely be a fun weekend for all ages!! More than $625,000 paid out over the past 25 years!!! A FEW OF OUR PAST TEXAS PRO CHALLENGE RACERS OVER THE PAST 26 YEARS! And these are just a few! This list is constantly growing longer every year! ★ Front gate admission must be paid with cash or check only. ★ Children 5 & under are FREE!
. *Gate admission accepts cash only. Registration accepts cash or all major credit cards. We will have the ENTIRE pit area around the complete racetrack open for parking & camping at this event! You will be able to park TRACKSIDE around the complete racetrack! Swan MX has 25+ acres of premium shaded grassy parking so there are plenty of premium spots to choose from! Be sure to park perpendicular to the fence – NOT parallel (either pull in or back in). Tune your radio to 96.9FM to hear announcements. Water will be available to fill your tank. There is no charge for parking or camping- it’s FREE!! All registration will take place on race weekends at the scoring tower using our touchscreen self-registration system. If you do not find yourself in the kiosk, or you are a brand new racer, you will need to fill out a paper entry form during registration so we can manually add you to our racing system for next time. Save time on race day if you’re already in our racing system! We can add you beforehand so you can register yourself using the kiosk when you arrive! You may email us (info@swanmx.com) the needed information and we will get you added! ★ There will be Organized Practice on Friday for all ages and skill levels. ★ No license or membership of any kind is needed to practice or race! NO RELEASE = NO RIDE! All riders under 18 years MUST have a parent present to sign a release. Or you may bring a NOTARIZED release signed by a parent. AN UNACCOMPANIED MINOR WILL NOT BE ALLOWED TO PRACTICE OR RACE UNLESS THEY HAVE A VALID CONSENT FORM. All minors attending this event without parents, must come with a NOTARIZED statement from parents or legal guardian giving permission for another adult to act as guardian to sign releases. 450 Open Pro (A) 122cc+ 2S & 4S SATURDAY FEATURED MONEY CLASS! 250 Pro (A) 122-250cc 2S & 4S (No 450F) SUNDAY FEATURED MONEY CLASS! Age Effective Dates: Amateur classes: January 1, 2017 | Vet classes: Day of event. • No one under the age of 14 is allowed to compete on a 250cc motorcycle. • No one under the age of 16 is allowed to compete on a 450cc motorcycle. ★ Water is available for washing bikes- bring your own power washer. ★ PARENTS, PLEASE help us! Pit riding is allowed, BUT must be kept in 1st gear on the roads- no riding in the grass. ★ Permitted pit vehicles include: Pit bikes, Golf carts, Side X Side, Scooters & bicycles with helmets. ★ All riders under 21 MUST wear a helmet when riding through the pits. ★ All pit vehicles must be parked for the night by 10 PM.